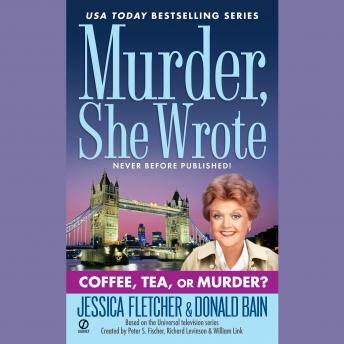 Murder, She Wrote: Coffee, Tea, or Murder? In this installment of the USA Today bestselling series, Jessica Fletcher, Cabot Cove’s crime-solving novelist, is on a new airline’s maiden flight when murder occurs en route. When Cabot Cove’s own Wayne Silverton wants to debut his new airline, he invites Jessica Fletcher and other locals on the inaugural flight from Boston to London. Jessica is thrilled for the opportunity to visit a dear friend, Scotland Yard inspector George Sutherland. But the reunion hits turbulence when George is called to the airport to investigate the apparent murder of Wayne Silverton. Jessica and George decide to put their finely honed sleuthing skills together and investigate. But there is a full passenger list of suspects who have something to gain by Silverton’s demise. Now Jessica will have to catch a killer before she can catch a flight home.